This week we completed on the sale of our house in London, so we are officially of no fixed abode at the moment. Mrs M has bought a car from the proceeds of the sale, a VW Fox, which has done an average of 500 miles a year over the last four years. Meanwhile, in Singapore, I spent much of the weekend working out why Photoshop's photomerge wasn't as good as I thought it was. 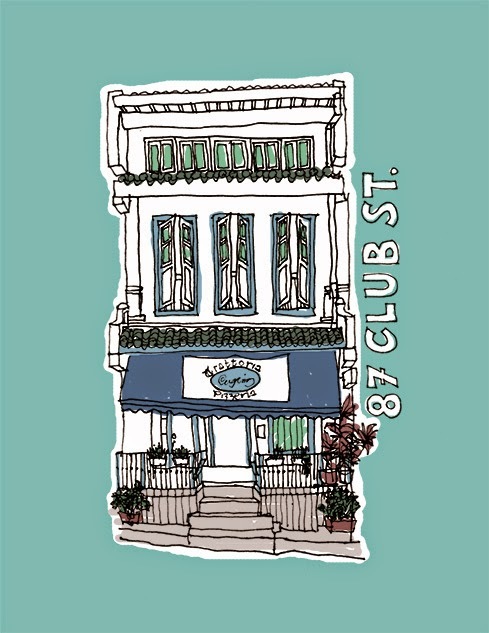 This morning, with a mountain of real work to, I was determined to fit in a quick shophouse sketch. The staff of the Trattoria Pizzeria Cugini on Club Street started to arrive as I commenced scribbling which was accompanied by a Bruno Mars album that drifted from across the road. I walked back to get some veggies from the market for the next few days, which cost $4.20 - the price of one carrot in Cold Storage.